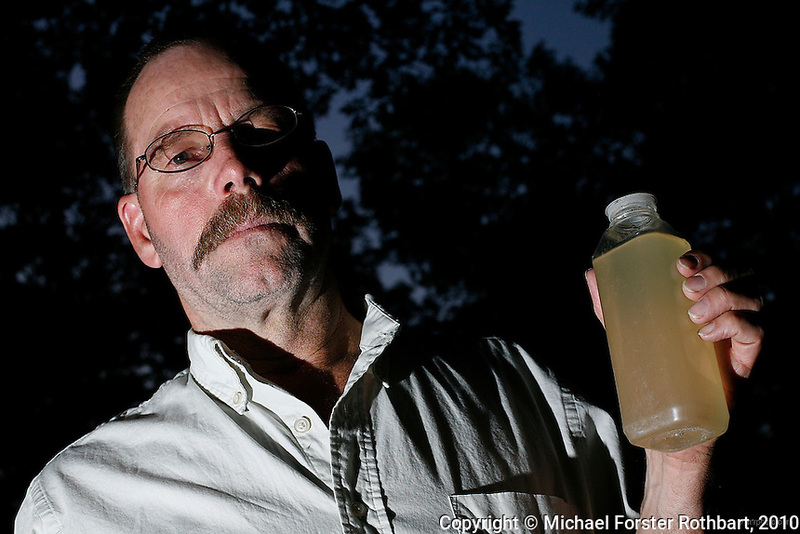 Craig Sautner of Dimock, PA, holds a bottle of his contaminated tap water collected in March 2010. Their water problems started in September 2008 after natural gas drilling on their property a month earlier. "Our water smells of diesel fuel," says Sautner. "In our water, we've found aluminum, manganese, chloride, iron, magnesium, sodium, strontium-T, all above the EPA limits, and TDS [Total Dissolved Solids] and other elements we can't disclose yet." Craig and Julie Sautner are among 14 families along Carter Road whose drinking water wells became contaminated with methane and other chemicals. Cabot Oil and Gas, the company held responsible by the Pennsylvania Department of Environmental Protection, has had at least 21 spills in Dimock Township in less than two years. The Sautners' well has so much methane that Craig can sometimes light his water on fire, and Cabot had to install an exhaust pipe to vent off excess methane. The 2005 Energy Policy Act exempted natural gas drilling from the Safe Drinking Water Act. Scientists have identified volatile organic compounds (VOCs) such as benzene, ethylbenzene, toluene, methane and xylene that have been found in contaminated drinking water near drilling sites.